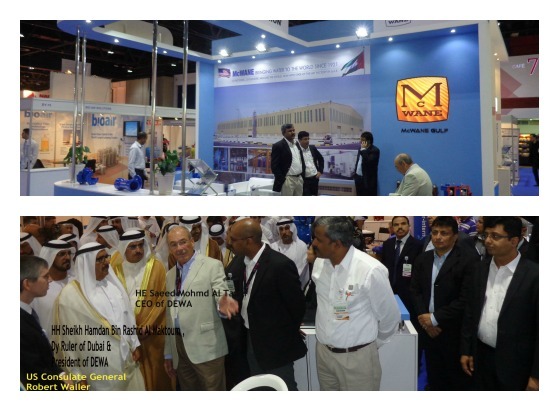 McWane Gulf participated in the 2015 Water, Energy, Technology and Environment Exhibition (WETEX). They participated in the American pavilion which was inaugurated by U.S. Consul General in Dubai Robert Waller. They were very impressed that McWane is investing in the UAE. We were the only investor amongst exhibitors in the U.S. Pavilion so when His Highness Sheikh Hamdan bin Rashid Al Maktoum Deputy Ruler of Dubai, Finance Minister of the UAE, President of DEWA, and Patron of WETEX and CEO Saeed Mohammed Al Tayer, MD & CEO of DEWA (Dubai Water and Electricity Authority) were visiting the American pavilion, they were introduced specifically to us. McWane Gulf General Manager/Vice President Ray Schofield explained to the VIPs about our investment in the UAE and we were well received at this Exhibition and got great exposure for our upcoming factory. On Friday, February 28, a group of eleven STEM (Science, Technology, Engineering and Mathematics) students from the University of Alabama visited M&H Valve Company in Anniston, Alabama, for a plant tour. M&H will be selecting a student from this group to participate in an internship this summer. The University of Alabama STEM Program focuses on attracting high-quality undergraduate students majoring in the science, technology, engineering and mathematics disciplines. The program is an innovative approach to engage students early on as undergraduates and employ nontraditional-classroom methods to allow top students to complete the MBA in one additional calendar year. The purpose of the path is to provide high-achieving students with the business knowledge needed to successfully manage businesses. McWane is always proud to assist the younger generation in reaching their goals. We hope the STEM students from the University of Alabama enjoyed and benefited from their visit!